Unfortunately politics is a blood sport. That is nothing new. It has been that way since the days of Julius Caesar. Fortunately, not everyone in our nation who votes sees things that way. Many of us voice our opinions, but have no interest in threatening or promising to embarass people who do not do exactly what we want them to do. But there will always be a few people who say things or act in ways that actually harm their cause rather than help it. Hot Air posted an article today that makes me wonder about the mentality behind a particular political campaign. Supporters of Democratic candidate Scott Wallace in Pennsylvania’s First District have been going house to house and leaving some door hangers reminding people to vote. Nothing wrong with that message, of course, but these particular pieces are being described as Orwellian because of the implied threat they contain. 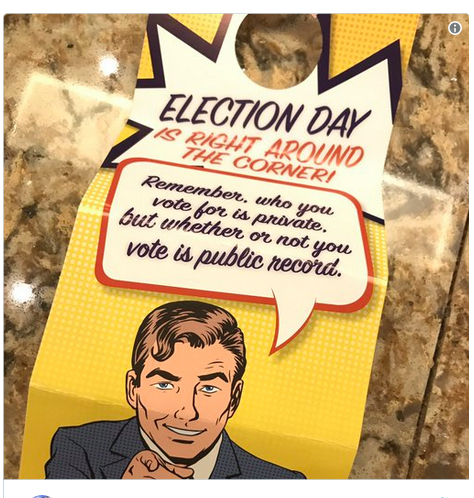 Rather than simply saying you should get out and vote, the hangers have a cheerful message reminding the resident that records of whether or not you voted are public. I strongly believe everyone should vote. However, I wonder if this door hanger is helpful to the cause. This entry was posted in Uncategorized and tagged Candidate, Democrat, Hot Air, Pennsylvania, Political campaign, Scott Wallace by granny g. Bookmark the permalink.